Bicom therapy is the future of medicine. Bicom’s biophysical communication therapy relies on the electromagnetic waves generated by the cells in the patient’s body, which allow it to identify and treat chronic pain, allergies, and more. Much like radio waves, or the Schumann resonances emitted by the Earth, these waves can’t be seen, but they carry essential information about what’s going on inside the body’s cells. Emerging research suggests that while the electromagnetic waves that healthy cells emit are symmetrical and therefore readable by the body’s other cells, unhealthy cells that are encountering a problem (such as chronic arthritic pain) emit waves that are asymmetrical, making it difficult for cells to communicate in any way besides chemical. Just as a radio can read radio waves, the Bicom device can read the body’s electromagnetic signals. And just as a radio can send out radio waves, the Bicom device can also send new signals to the body that can help correct the asymmetrical frequencies. Bicom therapy, as a biophysical therapy, complements modern medicine, which typically relies on biochemical methods. 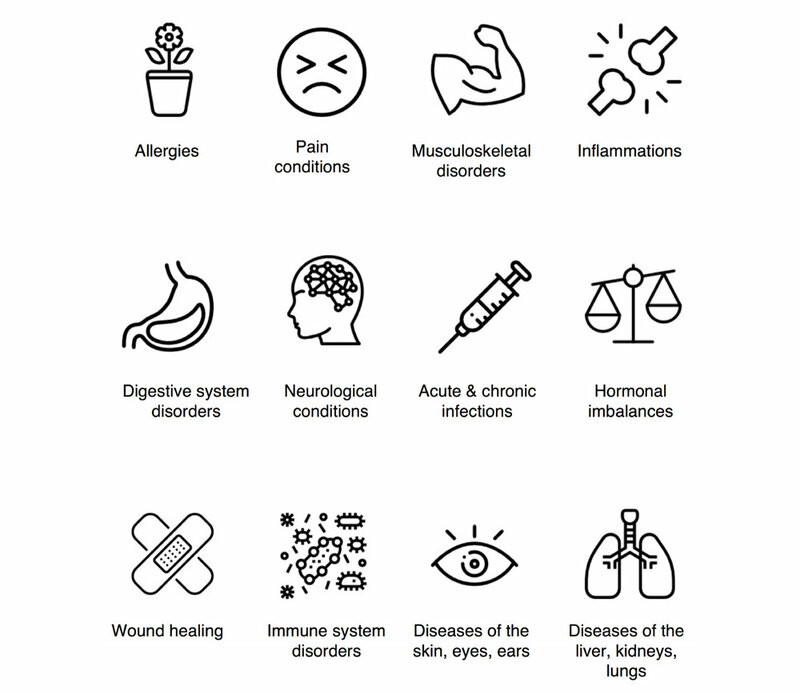 Following standard of care guidelines, Bicom therapy is often used in addition to modern drugs and treatment methods without adding additional negative side effects. Though the Bicom reads the body’s electromagnetic waves, it neutralizes distressed (asymmetrical) waves using magnetic frequencies only. This magnetic intervention encourages healing at the cellular level and is effective in treating allergies, chronic pain, musculoskeletal disorders, gastrointestinal disorders, and lyme disease in animals. We understand that treating allergies in pets is especially difficult. Animals can be allergic to the medication itself, or it just doesn’t work as well as intended. Treating chronic pain is similarly difficult; you can feel like you’re treating the symptoms without addressing the cause. With Bicom therapy, animals’ pain is reduced while identifying and treating the underlying cause. While we recommend adhering to standards of care for all treatments of animal patients, we also recommend Bicom therapy to treat allergies and chronic pain to many of our veterinarian therapists. That’s because Bicom therapy is different. It treats pets’ allergies and pain to encourage healing at the cellular level. Animals feel calm and relaxed during and after treatment, and the only side effect is that your patient may feel dehydrated after treatment. Bicom therapy’s effectiveness has been published in multiple peer reviewed studies, several of which are accessible through our Studies page (these may require a membership or subscription to the scientific journals in which they are published). It is used throughout Europe and can be found being used in hospitals across China. We invite you to visit also our featured story, where you can see how Bicom therapy helped Zachry, a 2 year old Golden Retriever experiencing idiopathic seizures, hypothyroidism, cluster seizures, and chronic diarrhea. We’re excited to showcase the possibilities of what Bicom can do for you! We understand that you may be concerned about the return on your investment. We’re in the process of publishing more information on your expected ROI based on data from real therapists across the country and the world. While that content is being developed, we invite you to contact us at office@biocommunication.us with any questions! We consider purchasing a Bicom device an investment in your patients’ future and an investment in the future of your practice. Ask us about our rental and leasing options. Let Bicom be the problem solver for your most difficult cases.